Ex rental Hidersine Vivente 3/4 size violin outfit. Details of Ex rental Hidersine Vivente 3/4 size violin outfit. This is a Student 3/4 size violin from Hidersine, a well respected and long time manufacturer of violin accessories. This year this violin has won the Music Industries award for the best value violin. The Vivente is made from nicely selected tonewoods with Ebony fittings of a high standard especially considering its modest price. We set them up in our workshop and even with the factory fitted strings this is a very pleasant violin to play. It's a good resonant violin and has plenty of projection on all strings. Quite loud when you need it but without the harshness that is apparent on some instruments of this price range. It comes with an octagonal stick bow with unbleached horse hair and a rosin, all housed in a very nice oblong case. The case is lined in dove grey plush fabric and covered externally with a black water resistant canvas type fabric. Inside there are two good sized compartments for a Shoulder Rest, Rosin and other gadgets. Externally there is a full length zipped pocket to hold music and other paperwork. It also comes with detachable straps so that it can be carried over the shoulder or on the back like a rucksack. A very worthwhile outfit with a nice sound and a very upmarket case. Superb value and suitable from beginner up to grade 5 or maybe more. 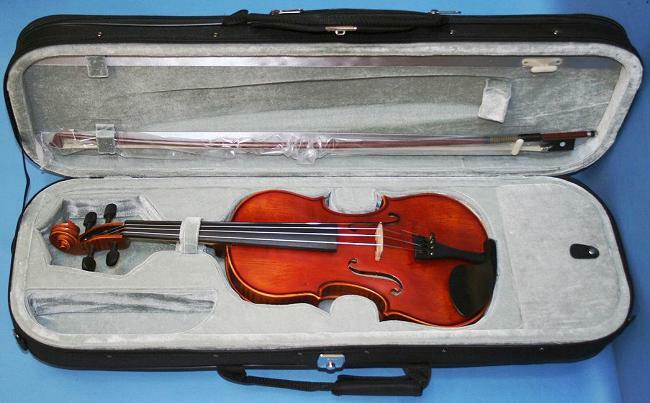 This is an ex Rental Violin that we have thoroughly cleaned and refurbished. The violin and the outfit is in very good condition, bit of a bargain.